You never quite know what to expect from Regina Spektor, whether it be her crazy theatrics or her extraordinary unique voice. This time, the Moscow-born, American singer has delivered a nostalgic and slightly melancholic collection of songs with her latest album What We Saw From The Cheap Seats. But the album is not without her trademark theatrical characters and stories that flow throughout each song. Spektor’s sixth studio album comprises both new and old material that had not been previously recorded. The newer of the tunes include ‘How’, ‘The Party’ and ‘Jessica’. ‘How’ could be best described as Spektor’s own take on a classic love ballad. Of course her fans will know she never does anything quite to standard, and this is probably the closest that she gets. What We Saw From The Cheap Seats also includes an alternate version of ‘Ne me quitte pas’ from 2002′s Songs, titled ‘Don’t Leave Me (Ne me quitte pas)’. The first single from the album ‘All The Rowboats’ showcases Spektor’s quirky style in a rather hauntingly eerie way. As a pianist, Spektor certainly knows how to best use her voice in conjunction with the piano in order to create the exact mood and atmosphere for the song. Throughout the lead single there is a sense of imminent danger and urgency keeping listeners on edge to the very end. In other songs like ‘Open’, Spektor seems to release a raw emotion which connects her to her audience. She sings of being “perpetually human, suspended and open” which is something that most of us can relate to feeling at one time or another. Her deep gasps for breath in the last verse of the song create the illusion that she is drowning, perhaps overcome with emotion. The album also has its uplifting tracks in ‘The Party’ as well as theatrical personas in ‘Oh Marcello’. In the latter Spektor embodies the mother of a possible serial killer. The song itself is seemingly a satire on catholic customs and while clearly there is a much deeper meaning underlying, it still serves as a fun offbeat song. Many of the other songs were leaked before the album was officially released but this did not deter any excitement from Spektor’s dedicated fans. As one of the most unique and powerful female voices of this time, Regina Spektor has gained a strong international following, and I doubt fans will be disappointed with What We Saw From The Cheap Seats. She was last on our shores for Splendour In The Grass last year but due to scheduling issues many reported that her set was drowned out by the artists on the Mix-Up stage. Now we have been given a second chance with a run of headline shows in December just announced; for fans both new and old, they are not to be missed. Lip has copies of What We Saw From The Cheap Seats to give away to three lucky readers thanks to Warner Music and Vice Royalty! To enter, email dunja@lipmag.com with your name and mailing address and the title of your favourite Regina Spektor song! 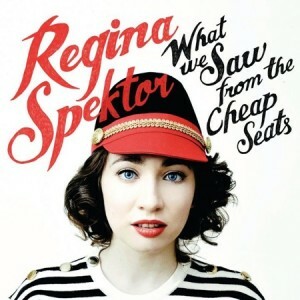 This entry was posted in Music and tagged album review, giveaway, Regina Spektor. Bookmark the permalink.